Red-D-Arc Welderentals™ is one of the world’s largest providers of welding and welding-related rental products and services. Red-D-Arc supplies clients with the equipment they need, when they need it, anywhere in the world. 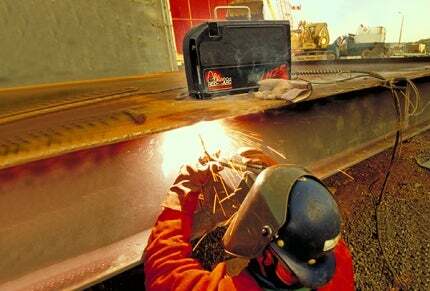 As a recognised welder rental specialist, Red-D-Arc’s fleet of welding and welding-related rental products includes more than 60,000 units, which are available worldwide. The company rents both electric and engine-driven welders for just about any process and application. There are many reasons why welding professionals rent from Red-D-Arc, including the company’s fleet size, equipment diversity, expert advice and equipment performance. Red-D-Arc’s cost-effective lease programme enables clients to acquire the most up-to-date core fleet of welding equipment available, without large upfront costs. Red-D-Arc’s welding positioners, manipulators, turning rolls and other weld automation products are available for sale, lease and rent through its global distribution network. The company’s line of welding positioners have been engineered and built to provide Extreme-Duty™ performance and reliability in harsh environments. Red-D-Arc’s standard product line of welding positioners are UL / CSA and CE certified for electrical controls and operational capacities, which is a weld automation industry first. The company’s welding positioner range includes manipulators, turning rolls, automated TIG cladding systems, growing lines and fit-up beds. It designs and builds complete turnkey weld automation packages, which can include integrated controls, such as digital touchscreen interfaces and camera systems to suit clients’ complete project requirements. Red-D-Arc’s team of engineers will provide clients with weld process recommendations and equipment set-up for optimised reliability, functionality and productivity. Red-D-Arc offers rental diesel, natural gas and hybrid dual-fuel engine-driven generators, as well as a full line of generator accessories, portable power distribution panels and towable light towers for clients’ temporary needs for jobsite electricity, power-distribution and lighting. The company’s D&D Power division also offers critical response services 24/7. As one of the leading power generation rental and service providers in south-west US, D&D Power keeps oilfield power generation equipment running with more than 40 service technicians covering the shale fields of Texas, Oklahoma and south-east New Mexico. The equipment range and process diversity offered by Red-D-Arc sets it apart in the welder rental industry. Beyond a basic offering of standard welding equipment products, the company also provides many specialty items to tackle any welding-related project. Red-D-Arc supplies a range of custom equipment, including semi-automatic and automatic wire feeders, compressors, electrode ovens, flux holding ovens, gas cylinder cages, heat treating systems, mobile welder certification trailers. In addition, the company provides oxy-fuel cutting equipment, air carbon arc gouging (CAC-A) equipment, pipe bevelers, plasma cutters, welding fume smoke extractors, blast cleaning equipment and induction heating systems. The company offers Cold Jet dry-ice blasting and Farrow media blasting equipment for rent, lease and sale, providing environmentally sustainable cleaning and advanced surface preparation. Induction heating systems (IHS) are also available for rent, lease and sale. The highly efficient technology uses non-contact heating to induce heat electromagnetically, rather than using flame or resistance, resulting in a faster, safer, more localised heat-treating process. Clients can browse Red-D-Arc’s used equipment website to view a real-time inventory of professionally maintained, used-welding and welding-related equipment, which are available to purchase. Red-D-Arc equipment is renowned for its durability and reliability and its master technicians continuously maintain all machinery. Red-D-Arc specialises in sales, repair, service and integration of computer numerical control (CNC) plasma and oxy-fuel cutting equipment with more than 20 years of combined experience across the team. The company is an authorised dealer for several major CNC plasma and oxy-fuel cutting equipment manufacturers. Red-D-Arc’s sales engineers are trained to find the best equipment fit for the client’s unique needs and budget. Its factory-trained technicians are authorised to perform warranty repairs, service and equipment set-up, as well as preventative maintenance to ensure optimal performance for a client’s cutting activities. Additional cutting table services include complete CNC cutting table retrofit services, training, spare parts and consumables. MacAljon, an industrial general contracting firm, has increased the productivity of its thin-wall tank manufacturing operation by more than 50% using the Red-D-Arc RDA MFUB-TW (fit-up bed for thin-wall cans). Several MX350 welding modules can be powered by either an electric power-source or an engine-driven power source for DC positive stick, MIG, and SubArc welding processes. The Breakaway Plus ships are two new passenger cruise ships being constructed by Meyer Werft, for Norwegian Cruise Line (NCL).